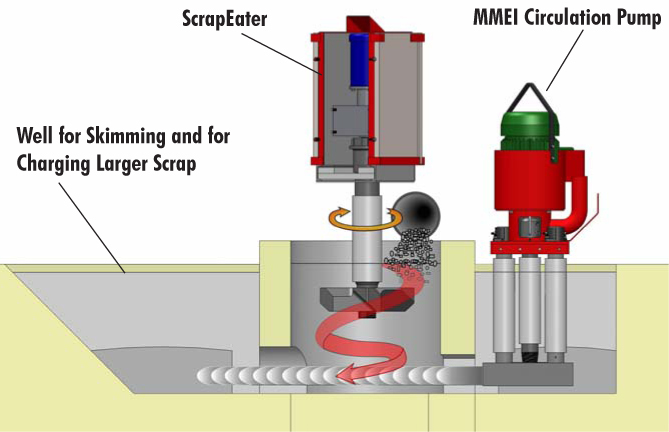 Are you dealing with high-volume, light-gauge scrap? Then you know the problems and understand the need for top-quality equipment for submerging scrap. That’s why Molten Metal Equipment Innovations designed The ScrapEater. It eats light-gauge scrap for breakfast. And then all day and all night long! It takes all you have to sooth its appetite for scrap! The ScrapEater will improve your metal reclamation rates significantly! Rates of improvement vary with user, but many achieve improvements of between 0.5 to 4 percentage points in their metal reclamation. With this kind of improvement, The ScrapEater pays for itself in a short period of time and then keeps paying dividends to your bottom line, pound-after-pound of melted scrap! The ScrapEater features our unique melter bottom, engineered to submerge more scrap faster at lower RPM’s. By spinning at lower RPM’s, less surface turbulence is produced which improves metal recovery. We also introduced to the market the threaded-nut design to provide a secure fit while enabling the shaft and melter bottom to be separated easily and reused. Quality craftmanship and rugged construction are hallmarks of all MMEI equipment. Our equipment is designed to provide maximum service life to keep you operating longer. The ScrapEater is also easy to operate and maintain. It comes completely assembled and can be mounted on the floor or furnace sill.